Ryan Smith is used to being associated with the term "Buckeye." After all, the in-state athlete plays at Buckeye High School (Medina, Ohio), where the school mascot is a Buck. Tuesday evening, he announced that he'll continue that trend as he committed to the Ohio State Buckeyes as a preferred walk-on. "I received the offer on the 10th [of October] and I was absolutely overjoyed," Smith told Eleven Warriors. "As a lifelong OSU fan this is my dream." Smith said he had two other offers, one from FCS Morehead State and the other from Lake Erie College, a Division II school. So naturally, when Ohio State called, he jumped. "When OSU contacted me, I was super excited and absolutely speechless," Smith said. "My biggest factor in choosing OSU is obviously just how great the school is academically and athletically. This opportunity is going to help me reach my peak in both aspects. I absolutely could not pass up the offer." The Thursday before the Buckeyes hosted Indiana, Smith received a text message from an Ohio State recruiter inviting him to be a guest of the school for a Saturday afternoon game against the Hoosiers. “I wasn’t expecting anything from them,” said Smith, who was recruited as an offensive lineman. “I was freaking out. The recruiter said they saw me from reading the article in The Gazette. Smith, a 2019 commit, is a 6-foot-3, 270-pound offensive tackle who also plays defensive end. The Buckeyes recruited him as an offensive lineman. "On the field, I feel I always know my job and always execute as fast and as physical as I can. I’d say my best traits are my relentlessness and my toughness. In high school, I play tackle but I can play any position. I believe my versatility is a good trait as well." His father was one of the most reliable wide receivers in the NFL during his playing days. So could Muhsin Muhammad III ever be a Buckeye? Well, the short answer is yes. Muhammad's father, Muhsin Muhammad II, spent 14 years in the NFL with both the Carolina Panthers and Chicago Bears. He totaled 11,438 career receiving yards and 62 touchdowns. So, without having to look any further, you know where Muhammad III gets his talent. 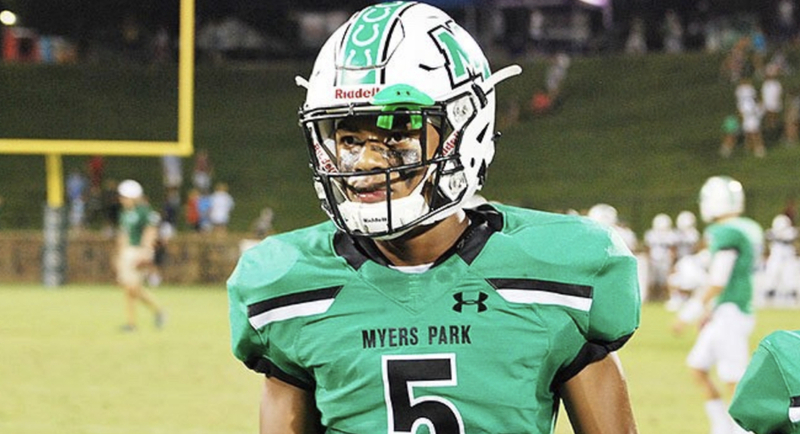 He's a 6-foot, 180-pound four-star receiver out of Myers Park (Charlotte, N.C.) with offers from N.C. State, Indiana, Michigan State and North Carolina, among others. Ohio State has yet to offer Muhammad III but the 2020 prospect has planned a visit to Columbus, Nov. 3. Michigan State seems to be the early leader in Muhammad III's recruitment, which makes sense considering the fact that his father played there as well from 1992-1995. Ohio State's need for a big-time running back commit in the 2019 class has been well-documented after former commit Sampson James flipped to Indiana less than two weeks ago. And as soon as James picked Indiana, many turned to IMG Academy (Bradenton, Fla.) running back Noah Cain. Cain, a four-star back and the sixth-best running back in the nation's rankings, says his relationship with Ohio State continues to grow stronger. The Buckeyes were certainly in contact with Cain even before James decommitted. He's expected to make a visit to Columbus on Nov. 24 when Michigan rolls into town. Current crystal ball predictions show both Texas and LSU to be the leaders in Cain's recruitment. However, the Buckeyes seem to be gaining steam in a process that's far from over. In any sense, that's a good sign.